Hurricane season surely isn't being kind to the US this year. The recovery in Texas following Harvey will take years and now Irma is threatening Florida as the strongest Atlantic hurricane ever. Two more storms are already brewing, and the season lasts through November! Having a plan in place in advance for every member of your family, both the 2-legged and the 4-legged, is vital to keep everyone safe. 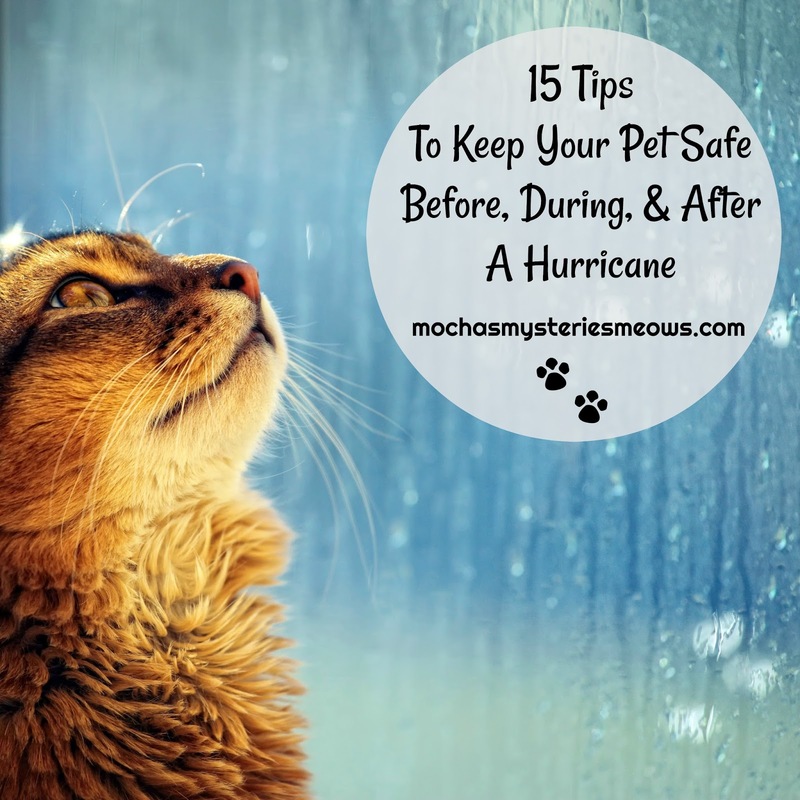 Our friends at American Humane have compiled a list of safety tips (we added a few of our own too), that not only covers preparations that can be made in advance of the storm, but also tips for riding it out and how to stay safe after it's over. Microchip pets or put a tag on their collar with your name, address and cellphone number so they may be returned quickly in case you are separated from your pets. Be sure that any microchip information is up-to-date. Know a safe place where your pets can go if you need to evacuate or seek shelter. Evacuation destinations may include a friend or family member’s home, going to a pet-friendly hotel, or temporarily housing your pet(s) at a boarding facility or vet's office. Find out from local officials which evacuation shelters allow pets ahead of time. Plan multiple routes to your safe destination. Review your evacuation plan and double-check emergency supplies – including bowls, water and food. Evacuate your family and pets as early as you can and remember to take your disaster preparedness kit for your pets (i.e. First Aid kit, leashes, and pets’ carrying cases, bowls, sanitation materials, favorite toy/bed/blanket, minimum 3 days, ideally 7-10 days of food, meds, water, your veterinarian’s contact information, a photo of your pet). Have a carrier at the ready. The portable carriers(s) should be large enough for your pets to stand-up and turn around in ready to go at a moment’s notice. Practice loading cats and dogs in pet carriers before you have to. Choose a safe room for riding out the storm— preferably an interior room without windows – and take your entire family there, including your pets. Stay with your pets. Distract them with games, toys and natural calming remedies and always keep them inside. Try to stay as calm as possible yourself. They have the ability to pick up on our emotions. Keep your emergency kit in that room with you (food, water, litter, meds, etc). Know your pet’s hiding places. That’s where they may run; keep them with you. Secure exits and cat doors so pets can’t escape into the storm. Do not tranquilize your pets. They’ll need their survival instincts should the storm require that. Make sure the storm has fully passed before going outside and assess damages before allowing children or animals out. Keep dogs on a leash and cats in a carrier, and children close at hand. Displaced objects and fallen trees can disorient pets and sharp debris could harm them. Give pets time to become re-oriented. Familiar scents and landmarks may be altered and cause a pet to become confused or lost. Keep animals away from downed power lines and water that may be contaminated. Uncertainty and change in the environment affect animals, too, presenting new stresses and dangers. Your pet’s behavior may change after a crisis, becoming more aggressive or self-protective. Be sensitive to these changes and keep more room between them, other animals, children or strangers. Animals need comforting, too. Comfort your pet with kind words and lots of pats or hugs. If possible, provide a safe and quiet environment, even if it is not their own home. Do you have any additional safety tips that should be added to the list? Thanks for sharing this. We should all have a plan & disaster kit, because you just never know what might happen. Great advice. Every pet parent should be prepared for their pets in case of disaster. We're purring for those affected by these recent hurricanes. These are such priceless tips. I am grateful that we live in a hurricane-free zone, and I am praying for those having to endure these natural disasters. They've closed our offices in Florida, and I've been in contact with my friends who live there. Hopefully that storm will weaken or veer off somehow! These are such great tips! Thank you for putting this together. It's very tough for pet owners, especially multi-cat households. I have been moving stuff over to my Mom's home, as I will weather the storm with her. Cats are going and I know it will freak them out. But we'll all be together. Excellent post, I hope to never need. Great tips thes are must reads for ANYONE in the path of these lethal events!! What you posted here makes so much sense. Anyway you might want to try a few boxes of piggy ears for pets. You can typically find good quality service from an online store. You can almost always locate what you need, and usually useful items you didn't know existed. The pets voucher codes are reasonable. The service is good. Take a look at what is available.